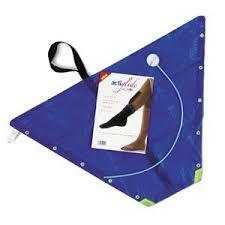 If you care for someone who needs to wear compression stockings you will know how impossible they can be to put on. Most family carers will not have had formal training and individuals often stop using their stockings as they find them such hard work. I recently returned to care work as an Assistant Manager of a care home after many years away from personal care and on my 3rd shift found myself changing a lovely ladies compression stockings. I had enough of a job to get them off her legs in the first place as they are designed to aid circulation with really strong compression to her legs. She then told me about her Acti-glide stocking aid. I have not used one before and there were no instructions. I consider myself to be an intuitive problem solver and eventually fathomed out how I believed it would be used. The Acti-glide was a great help and saved me and her legs from damage. I was still not convinced I had used it correctly though. I came home after my shift, determined not to be beaten, and looked the Acti-Glide up on You Tube. I am sharing it here to help you understand how it works and so you can use it properly from the start. You should be provided with one with the stockings but in some instances you may have to buy one.